Winter has brought us an interesting mix of weather this month with some rain and cloudy days, interspersed with chilly morning frosts followed by brilliant sunshine that just makes you want to get out in the garden and mingle with nature. 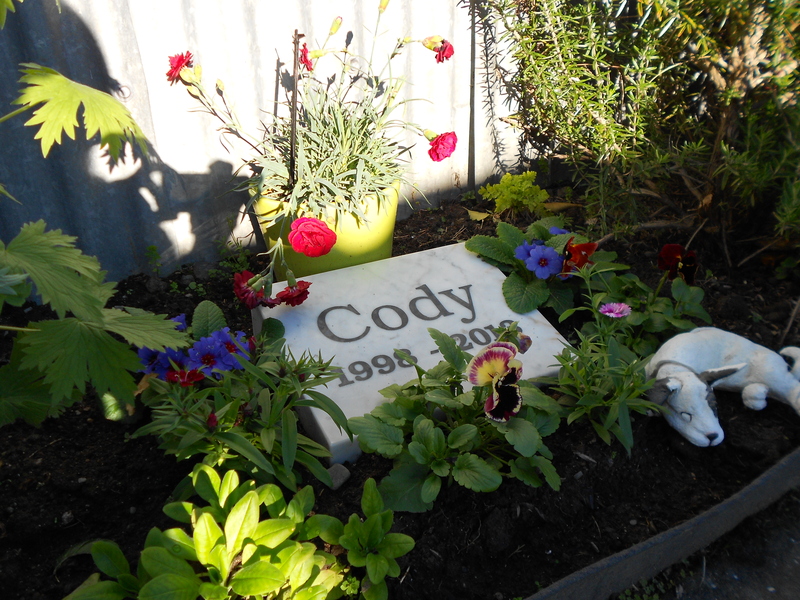 We made a little memorial garden for Cody next to the decking in our backyard, where we see it every time we go outside. We miss her terribly and still feel her presence everywhere. We planted winter flowers – pansies, primroses and dianthus, and I transplanted some forget-me-not seedlings to flower later. The little dog ornament looks so much like Cody! 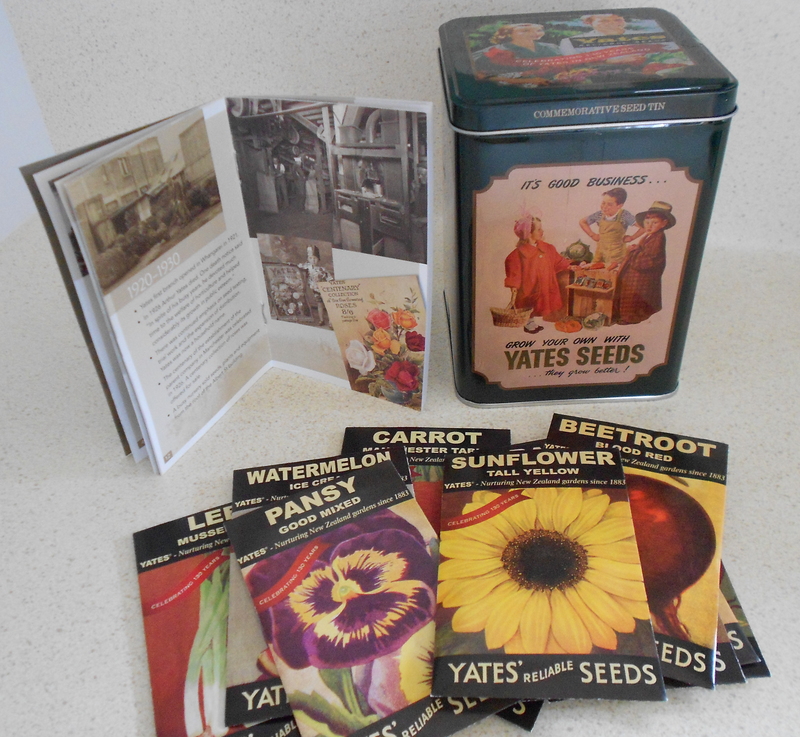 Our wonderful friend, Erica, gave us a tin of Yates heritage seeds to plant in our garden in memory of Cody. The seeds commemorate 130 years of Yates in New Zealand, and the tin comes with a little booklet telling the story of Arthur Yates, who emigrated to New Zealand from England in 1879. Following in his family’s tradition of seed merchants, he opened the first of his seed shops in Auckland, New Zealand, in 1883. Inside the tin there are 10 varieties of heritage flower and vegetable seeds – pansies, sunflowers, tomatoes and carrots, to name a few. I can’t wait for spring to come so I can start planting them! It’s lovely to have herbs in the garden over winter to add to stews and soups, stuffings, breads and vegetable dishes. One of my favourite winter meals is soup and crusty bread. 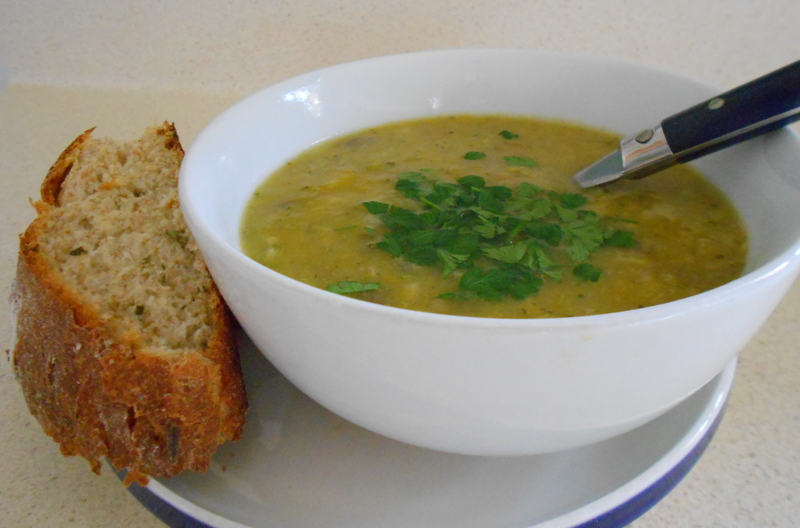 For this vegetable and lentil soup I used seasonal vegetables from one of our local market gardens and garnished it with parsley from our garden. For the herbed cheese bread I used organic goat’s cheese, and rosemary and sage from our garden. You can use whatever seasonal herbs you have in the garden. In the summer it would be nice with basil and oregano. Or if you don’t have herbs growing in the garden, it can just as easily be made with dried herbs. In a large bowl, mix together flour, yeast, sugar, salt, cheese and herbs. Make a well in the centre, then slowly add the oil and water, stirring to form a soft dough, and adding a little extra flour if necessary. Turn the dough onto a lightly floured surface and and knead for 10 minutes until the dough forms a soft ball. Shape into a round and place in a lightly oiled bowl, cover and leave to rise in a warm place for about an hour. Knead the dough lightly in the bowl, then shape into a round loaf and place onto a greased baking tray. Leave to rise in a warm place for about an hour, or until the dough has doubled in size. 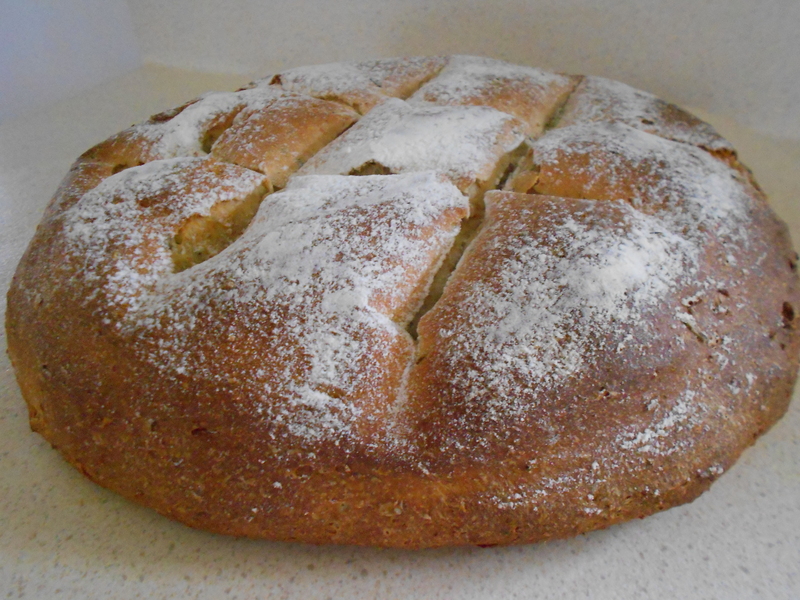 Preheat oven to 200º C. Dust bread with a little flour, cut criss crosses into the top, then bake for 30 minutes, covering top during cooking if it starts to burn. Alternatively, the dough can be made in a breadmaker, then shaped into a round, placed on a baking tray and left to rise as above. Place first 7 ingredients in large saucepan. Bring to boil and simmer 30 minutes. Puree or blend. Add milk and seasoning to taste. Heat without boiling. Garnish with chopped fresh parsley. This entry was posted in Garden Journal, My Blog, Recipes and tagged cooking, garden journal, herbed cheese bread, recipes, vegetable and lentil soup, Yates commemorative seed tin. Bookmark the permalink. 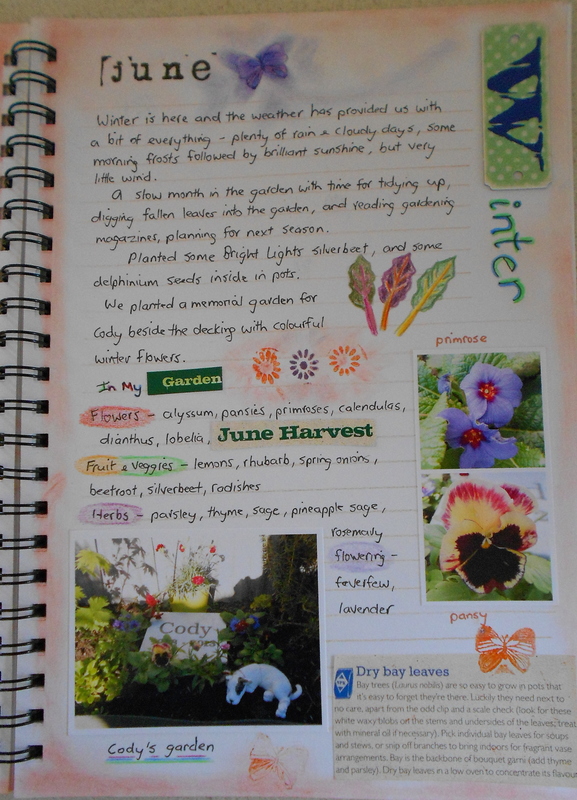 Your journal, notes and blog are lovely!